Enquiries regarding tickets should only be directed to 9587 5141. Do not contact the Shirley Burke Theatre directly as our ticketing system does not go through their box office. Mordialloc Theatre Company, PO Box 80, Mentone Vic 3194. Bookings for individual plays open approximately five weeks before each season starts. 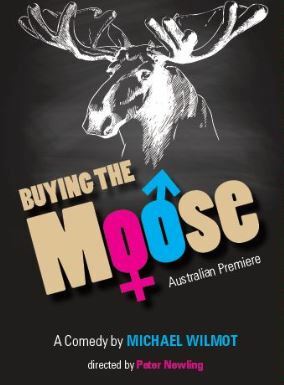 Book online for ‘Buying the Moose’. Betty comes home from a business trip to find Rob, her husband, dancing to a Tchaikovsky waltz – dressed in one of her favourite outfits – with an inflatable woman named Susan. Betty is not happy. Rob is philosophical. Rob’s brother Greg and his wife Cheryl come to the rescue and try to get to the bottom of this bizarre and potentially marriage ending behaviour. Strap in for two acts of delightful miscommunication and quirky plot twists.